A protester has been killed in eastern Turkey after clashes broke out over the removal of the statue of the founder of a Kurdish rebel group. Two others were wounded as protests sparked by the demolition of the controversial statue turned violent. Turkish security forces in the town of Lice attempted to dismantle the statue of Mahsum Korkmaz, founder of banned Kurdistan Workers Party (PKK). It was unveiled last week for the 30th anniversary of the PKK's first attacks. Protesters gathered at a cemetery outside Lice had tried to prevent the soldiers from reaching the statue and the incident quickly escalated, with the Turkish army firing live bullets. The victim is believed to be a 24-year-old demonstrator, according to the Turkish Hurriyet newspaper. Reports from the town say that he died of gunshot wounds to the head. The statue, which shows Korkmaz dressed for battle and with a rifle by his side, had infuriated Turkish nationalists who viewed it as a result of Prime Minister Recep Tayyip Erdogan's policy of granting greater rights to the country's Kurdish minority. On Monday, two days after the statue was unveiled, a court in Lice ordered its demolition following complaints that it promoted terrorism. Under Mr Erdogan, who has been prime minister since 2003 and last week won the country's first direct presidential election, Turkey is seeking to restart stalled peace talks with the separatist PKK. The rebel group has been designated a terrorist organisation by Turkey, the United States and European Union. 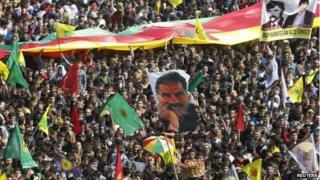 The conflict between Kurdish rebels and the Turkish state is estimated to have claimed the lives of more than 40,000 people. Video Who are the female fighters of the PKK?